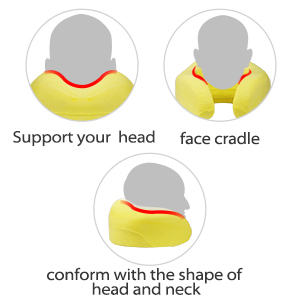 · HIGH-GRADE MEMORY FOAM - The memory foam travel neck pillow is lighter and softer that relieves neck and shoulder pain by allowing your muscles to fully relax. It is high breathable, slow resilience, effectively suppress mites and bacteria. 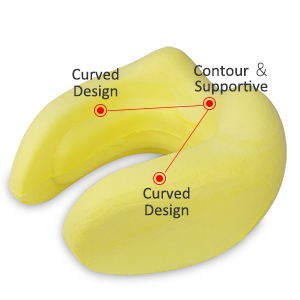 · UNIQUE CONCAVE DESIGN - The U-shaped and unique concave arc are ergonomic gold curvature of the spine, more fit your head and neck, eliminates painful pressure points, won't push your head forward causing annoying neck pain. 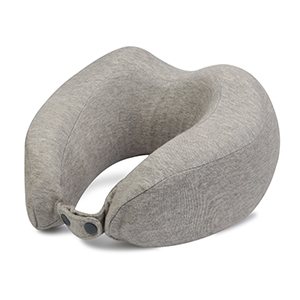 This travel pillow actually supports your neck without the awkward positioning and discomfort. · HYPOALLERGENIC COTTON COVER - The upgraded natural skin-friendly cotton cover is hypoallergenic, bacteria inhibiting and dust mite barrier. Nice stitching without lint shedding compared to the velour ones. 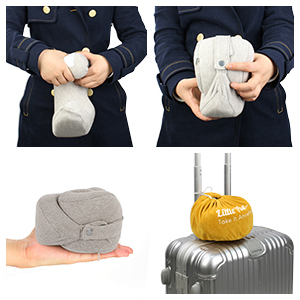 · PORTABLE AND EASY TO CARRY - The front and back snaps of the pillow make it easier to loop around to compress into a travel bag. 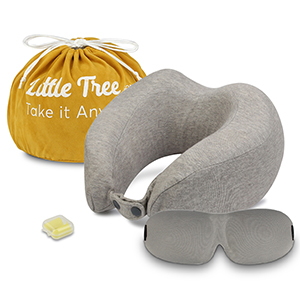 The sleep mask, earplugs and carry bag is the best kit for long trips on the airplane or in your car, and great for household. · 100% SATISFACTION GUARANTEE - We offer a 18-month-warranty plus lifetime warranty. 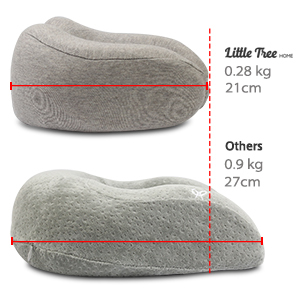 If you are not satisfied with our neck pillow, you can return it no-questions-asked for a 100% refund, so order now with confidence! 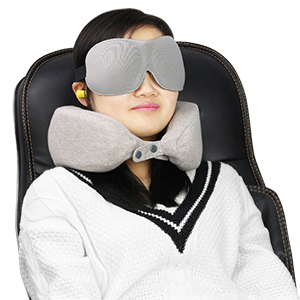 I purchased a brown one to replace my old travel pillow. It works pretty well. No inflation needed. It's very comfortable and super soft. The design looks cool and stylish. The size is perfect. It's easy to put away and storage during travel. Eye mask and ear plug are a big plus. So far so good and hopefully this review helps! 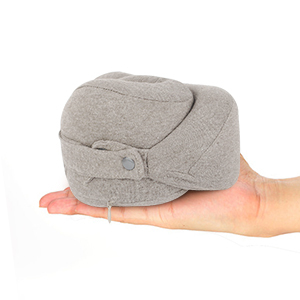 I been looking for a travel pillow for a while, This is an awesome travel pillow ! 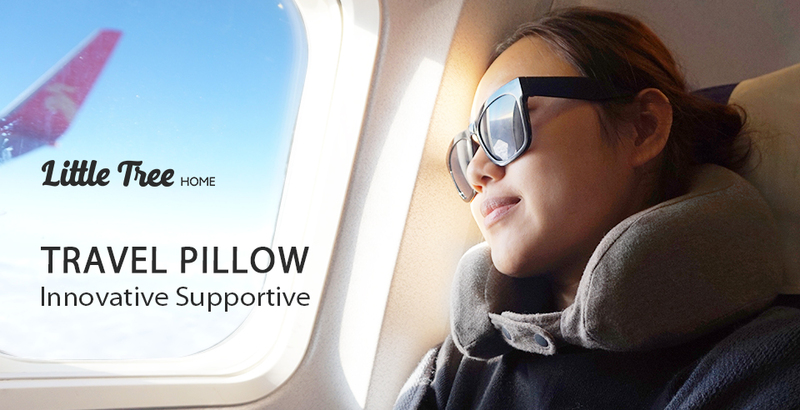 I have never been able to find a pillow that allows me to comfortably sleep on the plane while keeping my neck from flopping around. The memory form is very supportive to the back of the head too. Also this is easy to snap from front and back. I also put it in my car while I waiting for my customer. So I can take a little nap. Really soft neck pillow and seemed to ergonomically fit the neck. I'm tall and have a long neck. This pillow did not fit my neck well. I had no support and my head kept dipping when falling asleep which would startle me awake. I would have preferred a pillow that had stiffer memory foam and something that came up higher on the neck. Love this travel pillow set. It came with a super soft and good quality neck pillow, also came with earbuds and a eye mask. Love how it can fold and put everything inside the dust bag, can easily carry around. So far it’s the best travel pillow I had. Been trying it at home and it just so soft and comfortable. I’m sure this will make my flight easier.